Tammy Griffis has been in education for 23 years. During this time she has worked as a classroom assistant, office manager at Evergreen Elementary School, and administrative assistant in the Curriculum/Title I Department at Three Rivers School District office. She has been teaching 5th grade at Evergreen Elementary School for 5 years. She was excited about getting involved in the LIVE-C project, which brings a vast amount of learning opportunities to students. This year with funding she earned from the ECORS project, her students made a virtual field trip to the Carnegie Museum of Natural History to study about owls and owl pellet dissection. Next, her 5th graders wrote and illustrated mini-books and shared their stories via a virtual field trip with 1st graders at Wolf Creek Elementary School. As a conclusion to virtual field trips for the 07-08 school year, 5th graders studied Ancient Egypt and visited the Cleveland Museum of History to study Egyptian hieroglyphics. Tammy believes that using virtual field trips to enhance learning opens the world for students. They are able to connect with people and events in other areas they may not otherwise have known existed. Tammy is thrilled to be a part of the LIVE-C and ECORS communities and has enjoyed sharing the learning opportunities with the staff of Evergreen School. Jann and Debbie or Debbie and Jann—either way—they are a powerful team at Three Rivers School District. When they put their combined talents together (keep reading to find out about their individual talents), no obstacle or challenge is too great for them. 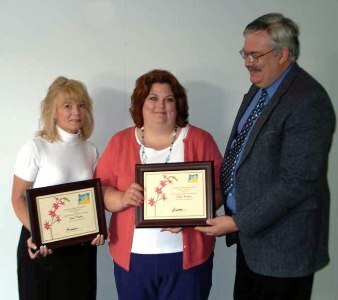 For their many contributions in spurring the use of technology in creative and exciting ways, SOESD, Technology and Media Services has chosen them co-Outstanding Administrators for 2007-08. Included in the long list of their accomplishments this year is the LIVE-C grant which used State funds to complete the installation of Mobile IVC equipment for all their schools by this fall. Along with excellent grant-writing abilities the duo found ways to fund upgrading their Network to enable more schools to make IVC connections. For their vision and hard work to make good things happen for students we have chose them as our Outstanding IVC Administrators this year. Jann Taylor has been in education for 25 years. During this time she has worked as a middle school social studies/language arts teacher, both an elementary and a middle school principal, and currently is the Curriculum and Federal Programs Director for Three Rivers School District. Jann enjoys working on innovative curriculum projects that engage and involve students of all ages in the learning process. Jann’s claim to tech fame is that, being totally self taught on using a computer, she taught herself (unintentionally) to operate the mouse upside down. 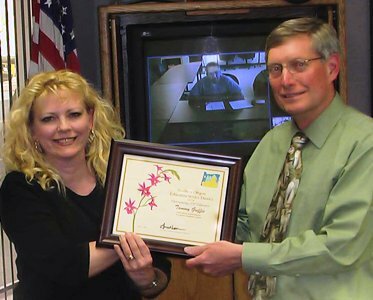 Debbie Breckner has been in education for 15 years. During this time she has worked as a middle school teacher, an elementary Title 1 Coordinator, both an elementary and a middle school principal, and currently is the Director of Human Resources/Technology Services for the Three Rivers School District. Debbie participates as a Leadership Team member for the Educational Technology Professional Development Cadre and enjoys working with others throughout the state to provide innovative technology tools that engage students in their learning. Debbie very much values the opportunity to work closely with Jann Taylor, Jay Matheson, Mike Prinslow, and other SOESD staff to provide these opportunities for students. One current project Jann and Debbie are working on together is called LIVE-C (Learning through Interactive Video Experiences and Conferencing). This project has placed mobile interactive video conferencing equipment in 5 schools (with the SOESD placing the same equipment in 5 more schools) with the goal of bringing “the world” to the students of Three Rivers through interactive field trips and classroom connections. Here are examples of some of the many global and local connections that have been made: World History students are involved in a year-long project with students in Gaza, anatomy students witnessed an autopsy, “field trips” have been taken to east coast museums, students and adults have been certified as First Responders, and classrooms of 5th graders have “taught” classrooms of 1st graders. The mobile interactive video conferencing equipment truly has unlimited potential to enhance learning!